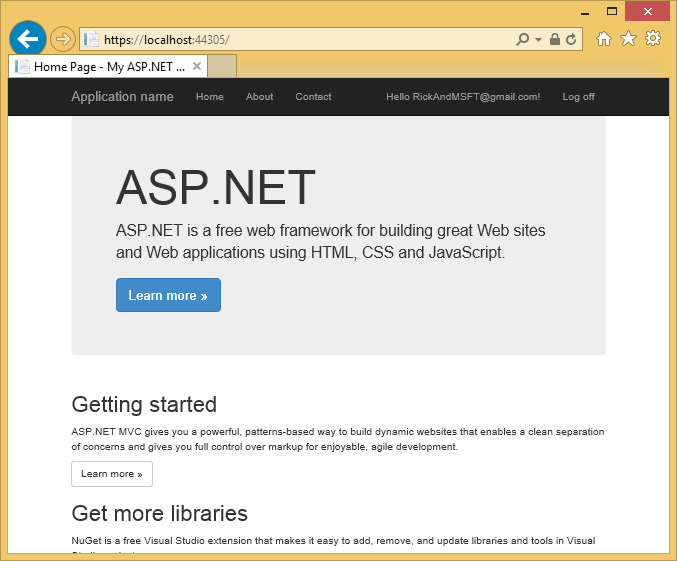 This tutorial shows you how to build an ASP.NET MVC 5 web app with email confirmation and password reset using the ASP.NET Identity membership system. You can download the completed application here. The download contains debugging helpers that let you test email confirmation and SMS without setting up an email or SMS provider. Warning: You must install Visual Studio 2013 Update 3 or higher to complete this tutorial. Run the app, click the Register link and register a user. At this point, the only validation on the email is with the [EmailAddress] attribute. In Server Explorer, navigate to Data Connections\DefaultConnection\Tables\AspNetUsers, right click and select Open table definition. Right click on the AspNetUsers table and select Show Table Data. At this point the email has not been confirmed. Click on the row and select delete. You'll add this email again in the next step, and send a confirmation email. It's a best practice to confirm the email of a new user registration to verify they are not impersonating someone else (that is, they haven't registered with someone else's email). Suppose you had a discussion forum, you would want to prevent "bob@example.com" from registering as "joe@contoso.com". Without email confirmation, "joe@contoso.com" could get unwanted email from your app. Suppose Bob accidentally registered as "bib@example.com" and hadn't noticed it, he wouldn't be able to use password recover because the app doesn't have his correct email. Email confirmation provides only limited protection from bots and doesn't provide protection from determined spammers, they have many working email aliases they can use to register. You generally want to prevent new users from posting any data to your web site before they have been confirmed by email, a SMS text message or another mechanism. In the sections below, we will enable email confirmation and modify the code to prevent newly registered users from logging in until their email has been confirmed. The instructions in this section are not current. See Configure SendGrid email provider for updated instructions. Although this tutorial only shows how to add email notification through SendGrid, you can send email using SMTP and other mechanisms (see additional resources). Security - Never store sensitive data in your source code. The account and credentials are stored in the appSetting. 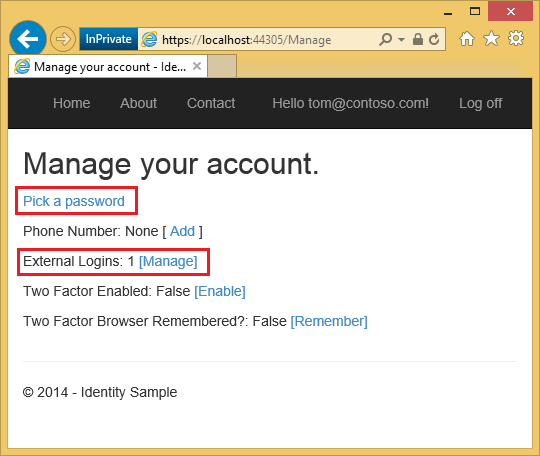 On Azure, you can securely store these values on the Configure tab in the Azure portal. 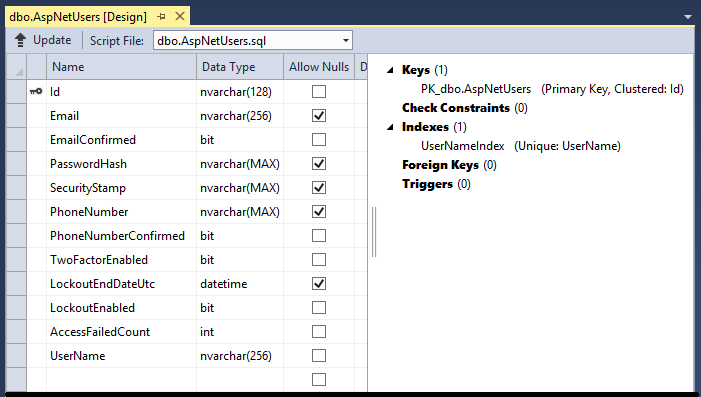 See Best practices for deploying passwords and other sensitive data to ASP.NET and Azure. "Confirm your account", "Please confirm your account by clicking <a href=\""
Run the app and click the Register link. Once you submit the registration form, you are logged in. Check your email account and click on the link to confirm your email. //  Comment the following line to prevent log in until the user is confirmed. ViewBag.Message = "Check your email and confirm your account, you must be confirmed "
By commenting out the SignInAsync method, the user will not be signed in by the registration. The TempData["ViewBagLink"] = callbackUrl; line can be used to debug the app and test registration without sending email. ViewBag.Message is used to display the confirm instructions. The download sample contains code to test email confirmation without setting up email, and can also be used to debug the application. Add the Authorize attribute to the Contact action method of the Home controller. You can click on the Contact link to verify anonymous users don't have access and authenticated users do have access. // Require the user to have a confirmed email before they can log on. Delete any accounts in the AspNetUsers table that contain the email alias you wish to test with. Run the app and verify you can't log in until you have confirmed your email address. Once you confirm your email address, click the Contact link. The Log in page will now show a link to reset the password. Once a user creates a new local account, they are emailed a confirmation link they are required to use before they can log on. If the user accidentally deletes the confirmation email, or the email never arrives, they will need the confirmation link sent again. The following code changes show how to enable this. ViewBag.errorMessage = "You must have a confirmed email to log on. " You can combine local and social accounts by clicking on your email link. 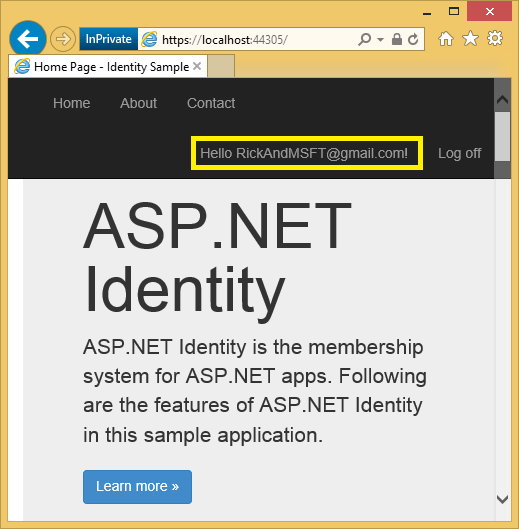 In the following sequence **RickAndMSFT@gmail.com** is first created as a local login, but you can create the account as a social log in first, then add a local login. Click on the Manage link. Note the External Logins: 0 associated with this account. Click the link to another log in service and accept the app requests. The two accounts have been combined, you will be able to log on with either account. You might want your users to add local accounts in case their social log in authentication service is down, or more likely they have lost access to their social account. In the following image, Tom is a social log in (which you can see from the External Logins: 1 shown on the page). 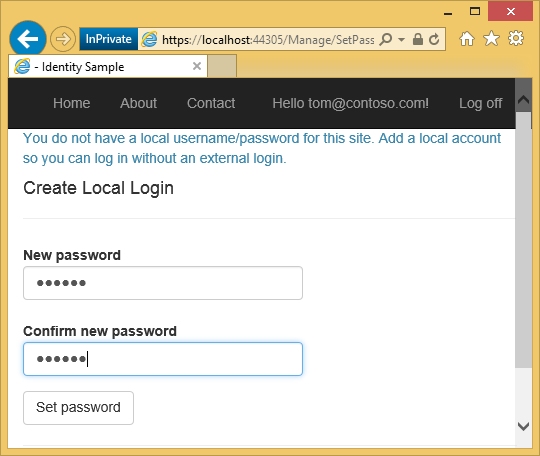 Clicking on Pick a password allows you to add a local log on associated with the same account. 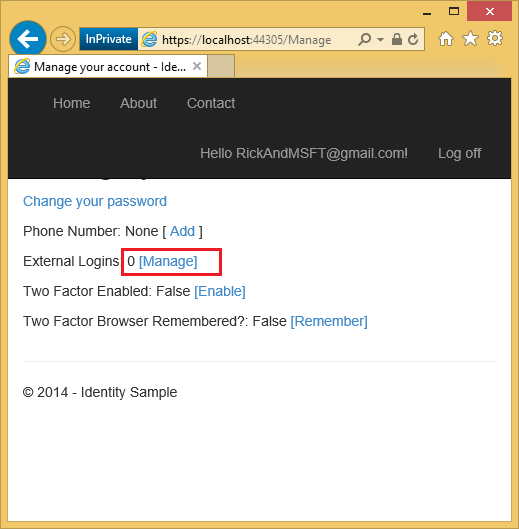 My tutorial Account Confirmation and Password Recovery with ASP.NET Identity goes into this topic with more details. Log into your SendGrid account and click on the Email Activity link. To test the verification link without email, download the completed sample. The confirmation link and confirmation codes will be displayed on the page. 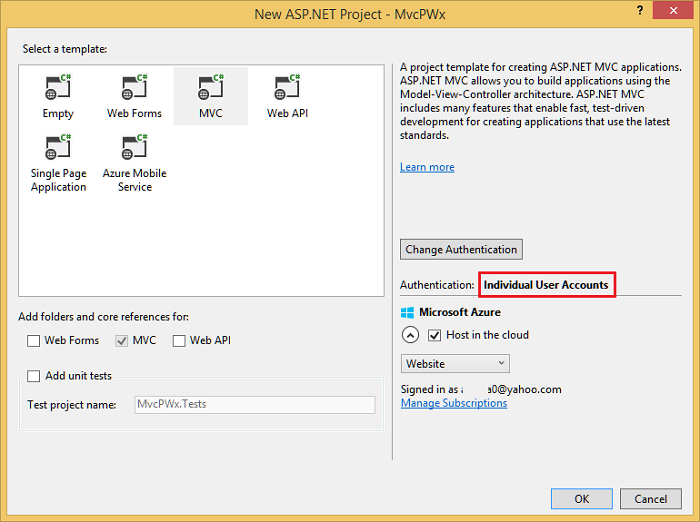 Deploy a Secure ASP.NET MVC app with Membership, OAuth, and SQL Database to Azure. This tutorial adds Azure deployment, how to secure your app with roles, how to use the membership API to add users and roles, and additional security features.